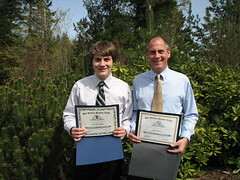 On Saturday, both Calvin and I received recognition at an award ceremony. Calvin was nominated by his teachers to receive the outstanding junior award, and I was nominated by my principals to receive the outstanding teacher award. Neither of us were selected for 'the grand prize,' but the Bulthuis' made a good showing at the district wide event. It was an honor which both of us appreciate.